A Scotsman in New Mexico. If this bottle were made in Scotland, it would be Whisky, but since it's a product of the good old US ingenuity and made the American way, it's a Whiskey. But don't hold it against it: it still has a Scottish soul, it's just made differently. Namely they used mesquite instead of peat while smoking their malted barley. The result the Santa Fe Spirits wanted to achieve with this is a smooth and balanced complexity of flavor. By the way, mesquite is one of the most expensive woods in America and it's found in the desert. A mature tree can cost more than a grand, but it's worth all its money when creating a complex Whiskey. 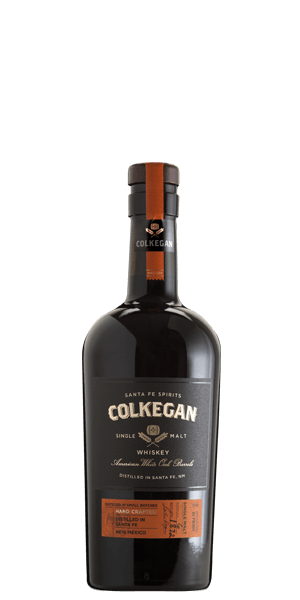 Colkegan Single Malt is matured in American oak barrels for two years seven thousand feet up in the desert, more specifically in climate-controlled warehouse where temperatures range from freezing to steaming. And they ain't doing it just for fun: variations in humidity and temperature bring unprecedented complexity out of the Spirit. It's the tradition from the Old Continent and fresh ideas from the New World that made this bottle and it's not surprising that it earned the second-highest score among all American Whiskeys back in 2015. What does Colkegan Single Malt Whiskey taste like? The Flavour Spiral™ shows the most common flavours that you'll taste in Colkegan Single Malt Whiskey and gives you a chance to have a taste of it before actually tasting it. Sweet with white chocolate, vanilla bean and marzipan balanced by floral notes and a woody scent. Notes of hickory wood, black currant and rhubarb, with an intensely smoky character. Smooth and mellow with a lounging taste of raspberries and a lasting impression. I really like this scotch! Fairly mild on the nose but complex taste with a hint of smoke. Just the right amount of spice! Great flavor. I find the Smokey notes to be a little harsh for me. The raspberry and white chocolate are quite enjoyable. Nice smooth smoky flavor that is not overpowering. Described as "honest" by my oldest son when we had a tasting. He nailed it. It starts and finishes smooth, nice flavor. The amount of smoke is nice. Nondescript. Average run of the mill . Drink alone. Not to impress. Vanilla nose and smooth through. I didn't get the smoky flavor as much as others. If I were to do a blind taste test, and have to guess what this was, I would pick Scotch every time. Very complex and smooth with a light smoky sweetness. Fitting a NM whiskey would be Very peppery and spicey on the nose and finish; over ice brings out more sweetness and takes the harshness out. Not as Smokey as I thought. Pretty good. Nice smoky flavor but I prefer peat over mesquite. Sweet and smoky, but very alcohol forward. I am a big scotch fan. And this american whiskey is nice. Some complexity with a nice heat. It’s slightly too sweet for my taste but probably would be just fine for someone who likes highland scotches. Mesquite smoke adds a subtle interesting flavor, which comes through even more in the aftertaste. Sweet, slightly floral taste. Mild nose, with a buttery middle and a mild finish. Nothing lingering too long, slightly malty finish. Of the 3 samples of "New World Single Malt", this was my favorite. Actually ordered a bottle of it through Flaviar the next night. The "wood smoke" sold it for me.....along with the warmth, sweetness, and baking spices. The finish is super long, and sweet ...maple syrup, burnt caramel, and hint of spice. Excellent after dinner by a fire. Strong and smoky, but added just a drop of water and it smoothed out nicely. This is one of my absolute favorite whiskeys. It's like a southwest scotch given the malted barley and non-peat smoke. It's very different from peat smokiness, but very warming and subtle enough to sip. Colkegan also has this same whiskey finished in their apple brandy casks that is EVEN BETTER! A little clumsy with lots of naked alcohol, but love the big smoke. I'm fairly convinced thanks mesquite doesn't belong in a single make whiskey. I've had this on some decent cocktails but it is not a sipper. Way too much smoke that doesn't balance well with the single malt sweetness. Really really enjoyed this one. Going to look into buying a bottle. I’ve found I enjoy smoke but not spice, and this was my favorite of the three in the “new world single malt” tasting kit. Pleasant sweetness, especially after a touch of water. Pleasantly surprising after the B selection. Flavor spiral seems attuned. Milk or white chocolate upfront with sweet smoke behind it. Floral, vanilla and sweet fruit follow for a smooth semi-dry finish. This compares favorably to highland malt finished in sherry cask. Price point seems fair. Will likely add to home bar in near future. Very nice whisky. I like the subtle smoke. Very syrupy mouthfeel. Good neat or on rocks! Couldn’t appreciate the smoke at all. I thought it was mislabeled. Super smooth, caramel flavors, and very easy to drink.